Amid a concentrated festival program, Leah Scholes’ Simulcast concert was scheduled simultaneously with a Xenakis keyboard marathon by Peter de Jager, the afternoon a kind of meta-simulcast of scheduling by BIFEM director David Chisholm. Thankfully these performances were repeated for those wanting to experience both; though the Xenakis program might have looked on paper the more intensive of the two, Simulcast was its true equal in quality and presentation, no less of a physical feat and with its own singular aesthetic. 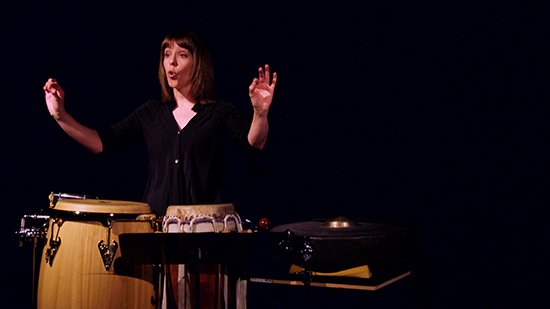 All five percussion pieces shared a concern with the uncomfortable interaction, the friction, between sound and meaning, and the slippage and failure of language. Mark Applebaum’s Aphasia enlists his percussionist not as a maker of sounds, or even as a striker of objects, but as a practitioner of a kind of fake sign language. There’s something absurd and yet sublime about the juxtaposition of mundane domestic signs—manipulating a Rubik’s Cube, swimming breaststroke, turning a vehicle’s ignition—with totally unfamiliar, otherworldly sounds, distortions of a human voice in the pre-recorded tape part. The voice is both synchronised with the signs and semantically alien to them: this is a form of puppetry more than any kind of meaningful sign language. Scholes combines the substantial repertoire of hand gestures with an entirely deadpan expression. There’s impressive counterpoint not only in passages of simultaneous and rapidly alternating gestures (all memorised in sync with the complex and rhythmically irregular tape part) but also between this highly animated, angular physical virtuosity and the deliberate blankness of the performer’s face and body. Furthermore, despite heavy processing, the taped voice is clearly recognisable as a deep male one. 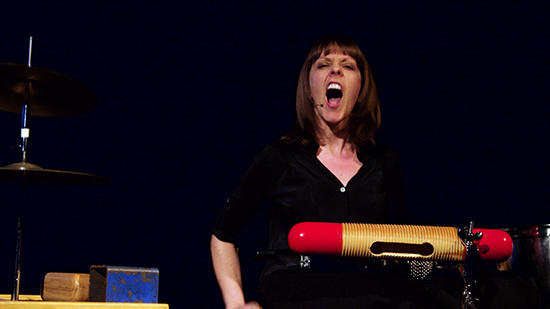 In this version of the piece, the disjunction between the sound of that voice (Nicholas Isherwood’s) and the physical appearance of the female performer heightens the sense of ventriloquism, an operatic alien puppeteer loading the performer’s semantic capacity with unfamiliar sounds, to be translated and performed as familiar but contextually meaningless gestures. What begins as a stream of audio-visual objects that could form meaningful language is revealed as a kind of expressive paralysis. All the pieces on the program shared Applebaum’s interest in spoken language, and perhaps in questioning its communicative function. However some works took a less cynical viewpoint. Far from deadpan, the emotional tone of Vinko Globokar’s Toucher was highly energetic, switching quickly between characters and conversations in an imaginary series of dialogues with the mathematician and astronomer Galileo Galilei. Toucher presented a kind of formalised musical lesson. After a short solfege-style key to the sounds we were about to hear (each specific syllable associated with a unique pop or swish of a percussion gesture), Scholes launched full speed ahead into these aphoristic encounters. Each section was clearly numbered and announced, including the pauses, much to the amusement of the audience. From what I could make out of the French, these sections were arranged in a non-linear order, and the spoken language came in and out of the texture while the percussive simulacra remained a constant, such that our focus (particularly for non-francophones) was not on deciphering direct semantic meaning, but on observing the inner logic of inflection and phrasing. Such was her familiarity with the material, so well ingrained was the cadence in her voice and hands, that Scholes was a perfect foil for the potentially didactic structure: nonchalant, incisive and theatrically convincing in embodying a whole cast of characters. Francois Sarhan’s Homework #1 (part of a series of music-theatre works by the composer) has neither historical figures nor universal signs to tie it to the concrete. Instead Sarhan employs the jargonistic language of instructional manuals to imagine a seemingly innocuous mechanical object which the performer is involved in building or fixing (“take the lip of the pipe” etc). What begins as a cheerfully optimistic charade (think daytime children’s television) soon dissolves into concern and then panic, as the exterior pragmatic world of systems and details comes into conflict with an interior emotional world—“no, not like that!”—and gets altogether out of control. At its climax Homework recalls Georges Aperghis’s Le corps à corps, in a complex groove of hitting, twisting and ragged breathing. Although some of the tiniest sounds—the facial percussion, for example—may have benefited from amplification, the increasingly urgent trajectory carried the listener’s attention right through to a silent, hollow coda. Rounding off a sleek and satisfying concert came Australian composer Kate Neal’s declamatory Self Accusation. Like the Globokar, Neal’s work conflated language and percussion gestures, but in a more insistent pulsation, a list of self-reflections that ranged from neutral observations to descriptions of restriction and conflict. Peter Handke’s 1966 text, Self-Accusation, had an appealing Beatnik quality, reveling in repetitive grammatical structures: it might invite comparison with Ginsberg’s seminal anti-establishment poem America. In the course of these five works (mirroring the structure of the Xenakis concert), Scholes revealed not only an attention to the finest details of complex percussion music (with the exception of the Rick Burkhardt duo that gave the concert its title, Scholes’ program was memorised, to an extreme degree of precision), but also a theatrical flair in spades, a special combination required to pull off such ambitious works. In this regard the expert contribution of director Penelope Bartlau should be specially acknowledged. Scholes used her own body and voice as a site of crisis and discovery, a site for a fascinating interplay of emotional and intellectual currents, interior and exterior worlds. It must be mentioned too that both the works and their interpretation were serious fun, the concert an unashamedly flamboyant and engaging vision of what music can be.